Millions of children who have been displaced by the conflict in Syria are facing a bleak future because of missing out on schooling. From this summer, SAT-7ACADEMY, a new educational TV channel from SAT-7 will bring hope to these children, and to millions more out-of-school kids across the Middle East and North Africa. 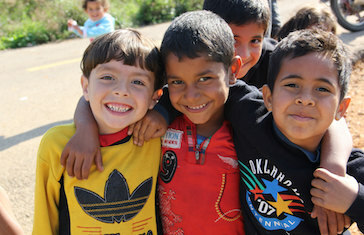 The Middle East and North Africa (MENA) is in the grip of a crisis in children’s education. UNDP reports on Arab Human Development (2003–2009) cited inadequate education as one of three key factors holding the Arab World back. Since then, instability and violence have further blighted the region. Devastating conflicts in Iraq and Syria have displaced millions and brought the educational system to a breaking point. Even in areas not directly affected by conflict, many children are not in school because of poverty, or even simply because they are girls. When Middle Eastern students can attend school, their teachers are often ill-equipped and poorly trained, teaching through rote learning and reliant on physical violence to maintain class discipline. The skills and values that help build character and shape better communities are not being taught. Parents, too, are in need of guidance to help them support truly meaningful learning for their children. In response to this dire need, SAT-7 will broadcast SAT-7 ACADEMY, beginning mid 2017, as a 24/7 educational channel that aims to inspire impactful, life-long learning across the MENA. The channel will bring hope to refugees, displaced and underprivileged children, and provide vital support for their parents and teachers. It aims to support and complement, not to replace, classroom-based learning where it is available. The new channel will reflect SAT-7’s holistic and internationally recognised values, and the network will work with well-known Non-Government Organisations (NGOs) who are highly experienced in providing educational services. Research in 15 MENA countries shows that television is the most used and trusted source of information, especially satellite TV, which continues to expand and is the first choice for most people. Nine out of ten (92 percent) favour satellite reception for both pay-TV and free-to-air viewing. A survey of over 2,400 Syrians, both in Syria and those that have fled to live elsewhere in the region, shows that television is dominant. More than 88 percent have access to a television and satellite dish even though many live in a refugee camp and might have very little else. Many Syrian refugees are already watching SAT-7’s educational program, My School, which is currently broadcast on the SAT-7 KIDS channel five days a week. According to audience research carried out by the well-known research company, IPSOS in 2016, in 10 Arab countries, My School was watched by over 1.3 million children in the MENA, and most of them were watching daily or at least once a week. As millions cannot attend school in their host countries, the opportunity that SAT-7 ACADEMY presents will be truly life-changing for many children, as well as for parents and teachers throughout the region. The programs will encourage children to treat those who are different to them as equals, and it will teach the critical thinking skills that help youngsters make their own life choices and understand that situations are usually not black and white. Teachers will be encouraged to move towards classroom practices that better encourage learning and foster creativity and decision-making. In this way, SAT-7 hopes to help build more tolerant, inclusive societies in the Arabic-speaking world. In launching SAT-7 ACADEMY, SAT-7 aims to transform young lives: to bring children hope for their future; opportunities for work and further study; and the chance to participate, along with their teachers and parents, in positively transforming the Middle East and North Africa. United Nations Development Program reports on Arab Human Development (2003–2009). Eutelsat Communications 2014 TV Observatory. Melki, “Syrian Audience Research 2016”.